I finished everything for Anna in time (and with some to spare!). Thursday night, I brought the bodice with me to rehearsal and finished stitching down all the binding. Friday, I finished the blouse, and brought the hooks and eyes at the neck to do backstage at the show. 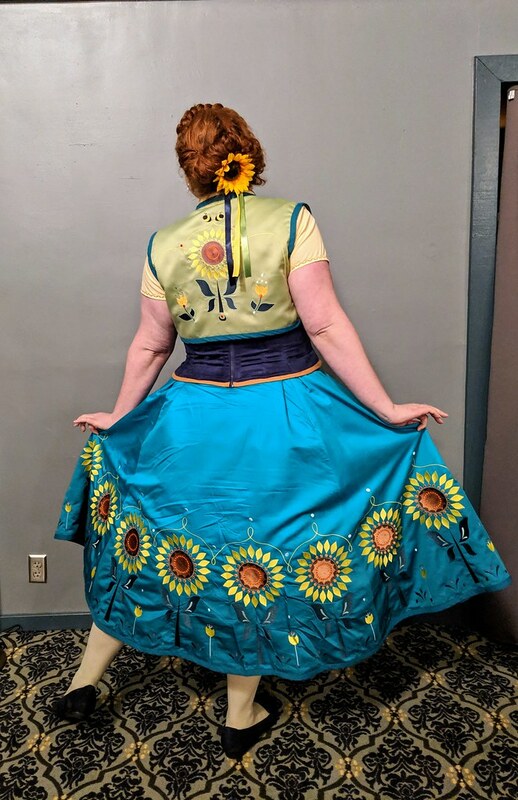 Saturday, I brought the skirt with me to the show, and had assistance picking off all the stabilizer from the back, plus I did the hooks and eyes at the waist. I wore it on Sunday to our cast party, since we decided we would all wear our Halloween costumes. Overnight Sunday, I came down with a hugely swollen sore throat, so I decided to stay home from work on Monday. I was originally thinking I would rest a bit and then try to run errands, clean the house, prep food for my Halloween party, and sew. My body had other ideas, and instead gave me aches, sensitive skin, chills, and extreme exhaustion. I made it off the couch long enough to run to the grocery store and go to rehearsal, since I had already missed so many dance rehearsals and didn't want to miss any more. The aches and chills and such subsided by Monday night, but the sore throat remained and was joined by congestion, so I decided to stay home Tuesday and sleep a bit more as well. But I'm really not that good at resting, so after getting a couple extra hours of sleep, I cleaned the house, made food for my party (don't worry, I washed my hands a ton! ), did laundry, and started packing for Disney. And went to rehearsal. 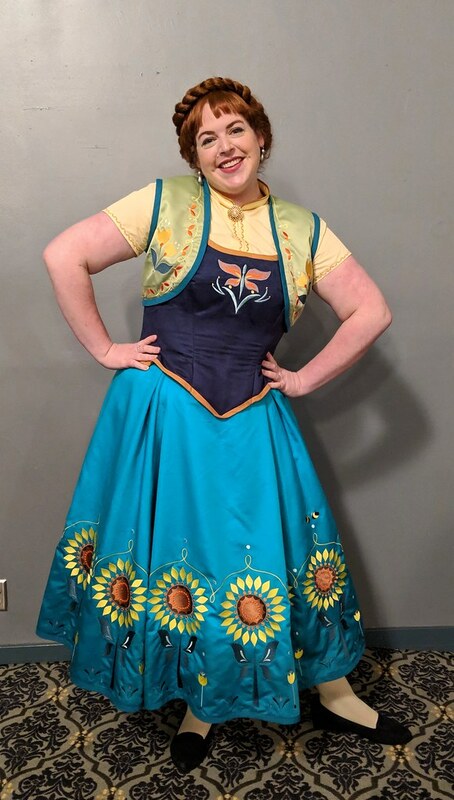 Unfortunately, the sewing did not happen, so that means no new blouse for Disney on Friday, since I'm out of time at this point. Also no tam for Merida, though I think I will take bit of the plaid and make a hat decoration for a basic brown vintage hat I have. I'm at work today, but still with a very sore throat, congestion, and almost no voice, so I had to cancel the gig I was supposed to do today. 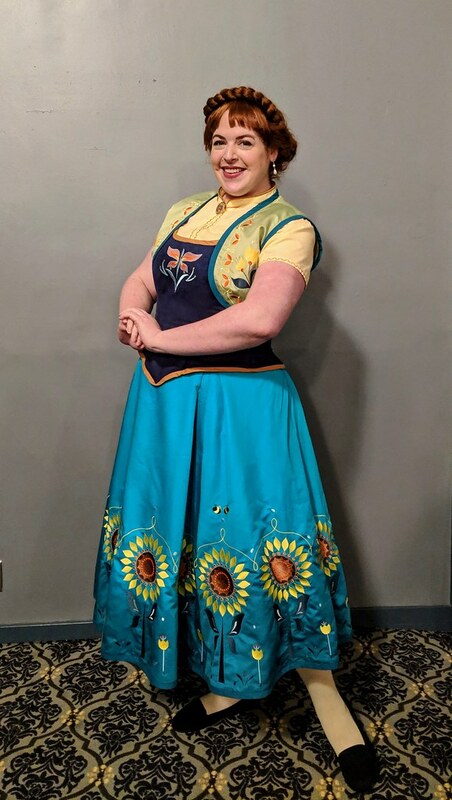 I am dressed up in my Anna costume, though! And I took a bit of time out this morning and went to the doctor to see if it was strep throat. It's not, just a viral infection, so there's nothing I can do but hope that it goes away by the time I get to Disneyland on Friday! I'm having a Halloween party tonight, so after work, I'll be frosting cupcakes, and doing a little bit of last minute set-up. 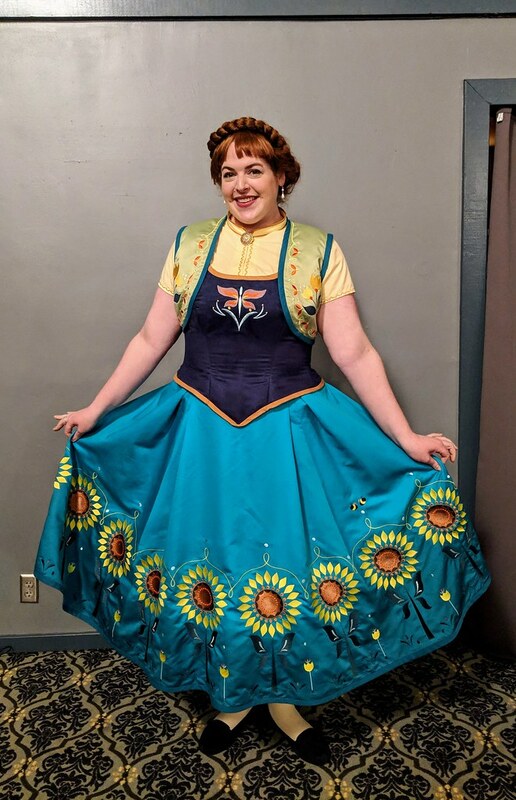 I also plan to serge the edges of some of the leftover Anna vest fabric to make a scarf for the Anna bound (wearing the vest at the park I think pushes it into costume-land). I also need to do most of the rest of my packing tonight, since I'll have almost no time to do it tomorrow with work and rehearsal. Then I head to the airport at 5:30am on Friday!